Ever since the all new fourth generation Lexus GS350 came out, many people loved the new design and went from other car makers to join the Lexus family. It has been one of the most popular Lexus vehicles to date that everyone loves. The new styling and all the new aggressive front end and its driving characteristics give the family sedan an edge to it’s competitors. 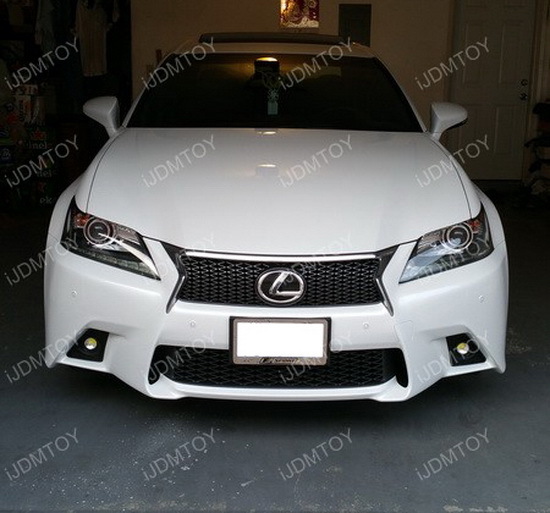 With many people getting the F-Sport model, the only flaw is that it has no fog lights which is why we came out with the iJDMTOY Lexus GS F Sport LED Fog Lights. 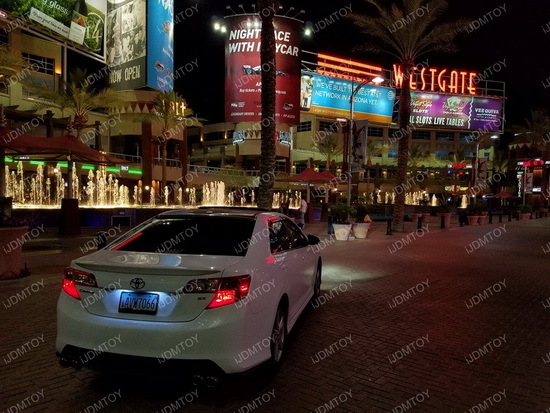 A big thank you to Trevor for sending out pictures of his Lexus GS350 with our LED’s on them. These are high powered BMW LED angel eyes with the new xenon white upgrade to get rid of the stock angel eyes once and for all. It gives you a matching HID look like what you see on the 2011 BMW 3 Series and the 2011 BMW 5 Series. 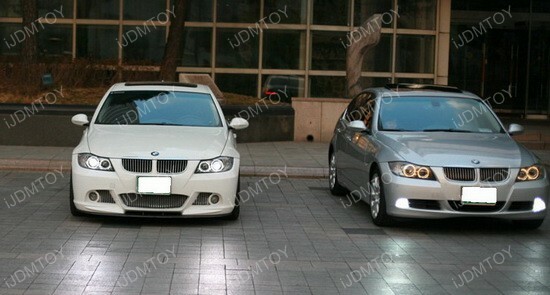 The angel eyes are for 2006-2008 3 Series with pre-LCI for a whole new facelift. The LED angel eye ring marker bulbs are error free so you don’t have to deal with that pesky error message that sometimes plagues all European car owners. 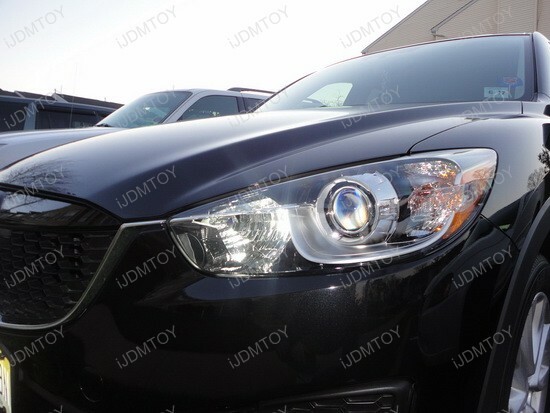 For most of the newer passenger cars that are equipped with factory daytime running lights, they also function as another type of light such as the turn signals or more commonly, the high beams. This is true for most vehicles, but for a select few, they have dedicated daytime running light bulbs depending on what type of headlight trim the vehicle has. 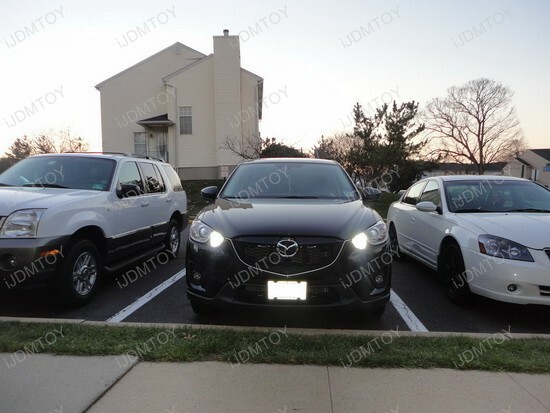 In the case of the 2013+ Mazda CX-5’s, the halogen headlight trim uses the high beams at half power as the daytime running lights and the HID/Xenon headlight trim uses a dedicated daytime running light. With these cars, the high beams are separate and are not changed when changing the daytime running lights. The factory daytime running light is a P13W sized bulb and can be replaced by our Plasma High Power P13W LED Bulbs; each bulb produces 5W for a super bright output. 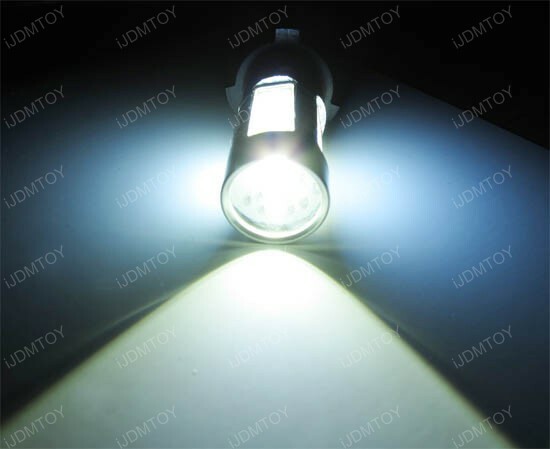 Each bulb contains one CREE Q5 High Power LED on the top with magnified optical projector lens and four 3-Emitter Plasma LEDs on the side to create 360 degrees of light. These are a direct replacement and require no modification of the wires and no additional components. 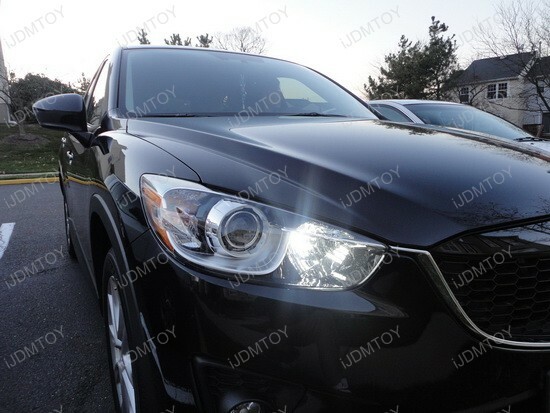 Other drivers will definitely notice you with a 1200 lumen of output per bulb during the day; this is a wonderful safety and aesthetic upgrade for your CX-5. This highly aesthetic upgrade is one that you should add onto your wish list. 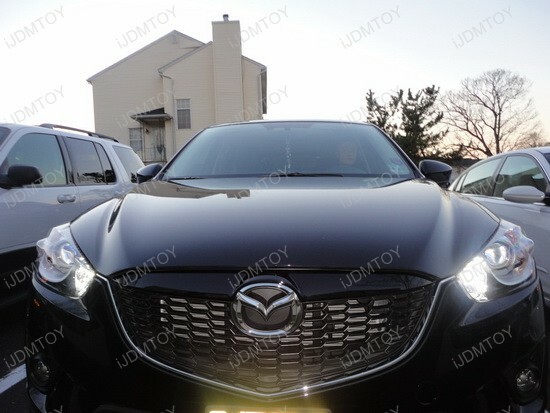 LED daytime running lights are a cost-effective way to upgrade the look of your car to something more modern looking; instead of spending hundreds of dollars on an HID kit additional parts, you can attain the same type of 6000K Xenon White look with these LED replacement bulbs. 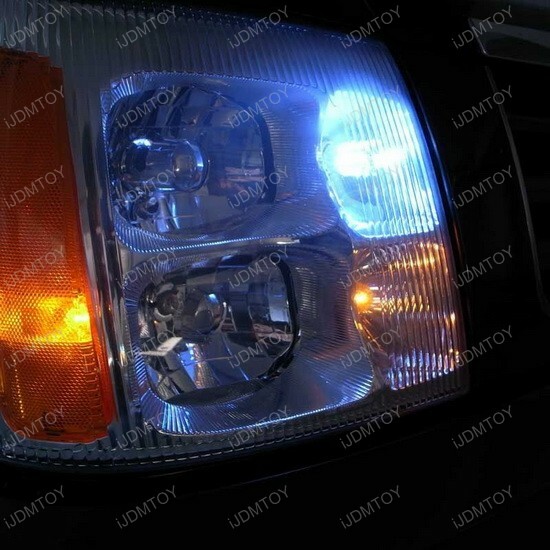 Stand out from the rest of the traffic with these lights for your car. The Cadillac Escalade is a fairly large vehicle with headlights relative to the overall size of the car. Since the headlight is so large, it has room to have dedicated lights to serve one purpose such as the daytime running lights, parking lights, and turn signals. Since the daytime running lights are one dedicated bulb, it is easy to replace and requires no additional components. The Cadillac Escalade uses 3157/4157 sized bulbs for the daytime running light bulbs and we have a suitable plug and play replacement. 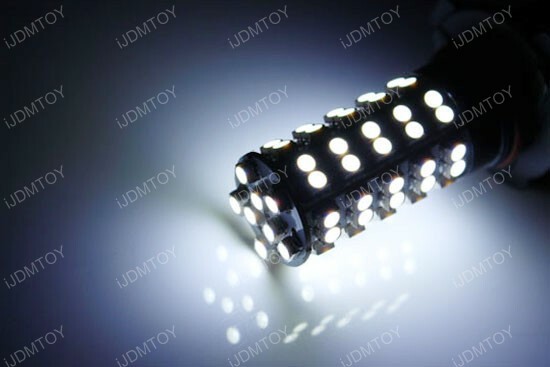 Our 68-SMD 3157 LED Replacement Bulbs are part of our very popular “68-SMD” series; these bulbs are known for their color, brightness, and affordability. Like many dedicated daytime running lights, separates components such as resistors and decoders are not required for installation. These are just plug and play meaning they replace the factory bulb directly with no modifications required. Because the LEDs cover the entire surface area of the bulb, 360 degrees of light coverage is produced so the whole housing is filled with light. 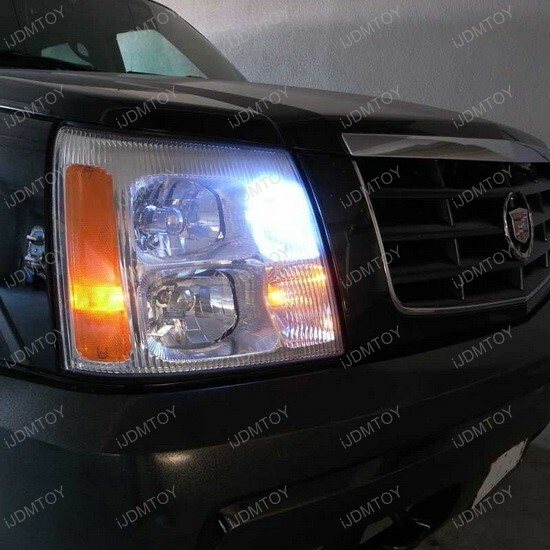 With 20,000 estimated working hours, these will surely outlive the life of your car; these LED replacement bulbs are a great way to update the look of your Escalade. Since HID lights are not available in this size, LED replacement bulbs are the perfect way to get that same look for a much cheaper price.